Sammy Hagar, From Colton, California, was popular in the early- mid 1980's for fast paced, guitar-driven, hard rock with a masculine, lets-go-party attitude, joined the band Van Halen as lead vocalist after David Lee Roth's departure from the group. (Before joining Van Halen he sang lead vocals in Ronnie Montrose's classic rock band Montrose, and had some single output, notably his release, "I Can't Drive 55". As much as it was public surprise when Hagar joined the band, so it was when he left. Sammy Hagar now peddles his own line of high-quality "Cabo Wabo" tequila. In the Spring of 2007, Hagar sold his stake in Cabo Wabo tequila to an Italian beverage company for a reported $80 million. Hagar, now a sort of modern-day Jimmy Buffett, has earned his place in rock n roll history as one of hard rock's premier front men who not only has an ample, strong, belting vocal range with soulful melody and tone, but his duality as a formidable lead guitarist and guitar-riff-monger puts him in a league shared with few others in terms of versatility and overall right to rock. He now tours with Mike Anthony, former bassist for Van Halen. He resides with his family in Mill Valley, CA. 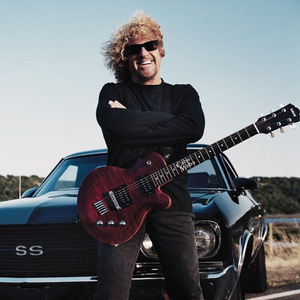 Sammy Hagar is also known as the Red Rocker, due to the fact he almost always wears red shirts or plays a red guitar, or more likely that he has red hair? Seems that Chickenfoot is on a hiatus as Joe Satriani has gone back to solo and CF has yet to follow up with a new LP.